Nigerians are evaluating the situation. They have been reminded of how we got to where we are. The fallout of the situation is the politicization of terror. The story was as chilling as it could be. The magnitude of the loss was almost unspeakable. Even though we seem to have become accustomed to shock and horror, we could not look the other way when the news filtered out on Sunday. The story was that Boko Haram, the terrorist Islamic group, acting in concert with its ally, the Islamic State of West Africa (ISWA), has massacred over 100 soldiers of the Nigerian Army Battalion in Metele village, Guzamala local government area of Borno State. As is usual in Nigeria, the casualty figures were conflicting. The actual figure was shrouded in secrecy for days. The Nigerian Army could not be exact. But after so much prodding and scrutiny, we have been told that some 118 soldiers and civilian locals were killed by the terrorists. Scores of others are said to be missing. Meanwhile, the identity of the dead soldiers remains a top secret. The authorities are yet to make a categorical pronouncement on this. We are still waiting for the Chief of Army Staff, Tukur Buratai, to speak up. had brought to bear on terrorism. He also told Nigerians in clear terms that terrorism had come to stay in Nigeria. 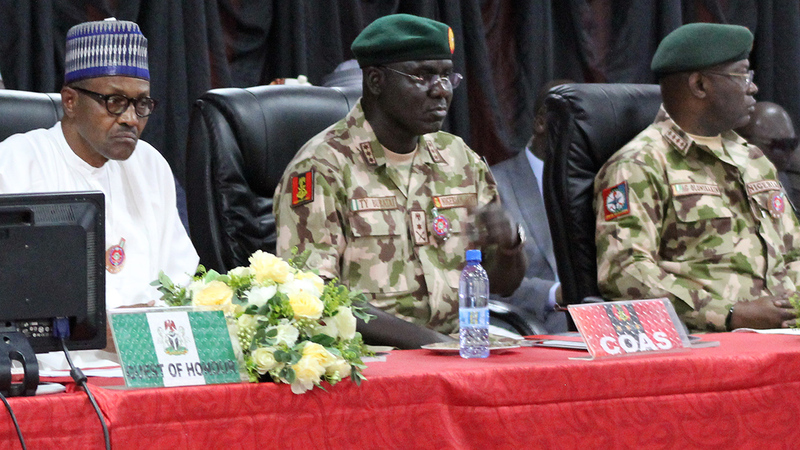 As a way out, the NCS advised that the country should put in place adequate arrangements for fighting terrorism. It recommended that there should be training and retraining of security operatives on modern security management. It also recommended that security personnel should be provided with modern equipment with which to combat terrorism, among other recommendations. The government of the day took these issues seriously and also took steps to ensure the implementation of the recommendations. It was in the course of this that Azazi was blackmailed out of office. President Goodluck Jonathan was made to believe that Azazi as a southerner cannot be effective as NSA. They sold to the president the idea that it is only northerners that understand the language of security in Nigeria. Jonathan fell for the blackmail and Azazi lost his job. With a northern replacement in place, Jonathan went all out to implement the recommendations of the NCS on how terrorism can be stemmed. But politics took over from here. Whereas Jonathan worked hard, especially in the last days of his administration to ensure that Boko Haram was stopped on its tracks, anti-Jonathan forces came up with a counter narrative. They gave an impression that suggested that the war against terror was between them and Jonathan. They dismissed all the efforts of the government towards defeating terrorism as ineffectual. Nigeria and the outside world were made to believe that the government of the day lacked the capacity to rein in the terrorists. The logical consequence of this narrative was the conspiracy that led to the sack of Jonathan from Aso Rock. Those who took over from Jonathan therefore came into power with the impression that they possessed the magic wand. They made Nigerians to believe that they had a magic formula with which they would root out Boko Haram. It was on the strength of this that the new government, less than six months after assumption of office , declared triumphantly that it had defeated Boko Haram. It had to do this to fit into the narrative that brought it into office. It needed to tell Nigerians that they were not mistaken in voting in the new order. The new government just wanted to justify its existence. In doing this, it ensured that it concealed the truth from the people. And that truth is that Boko Haram has not been defeated. It is still a threat to the country. But the situation had to be made to look good so that those who were taken in by the falsehood would continue to paint Jonathan and his government in lurid colours. But truth cannot be buried for too long. That is why it has begun to expose the underbelly of those who set out to give it a new name. Even though Boko Haram has been demonstrating in the last three years that it is still strong and potent on our shores through its unceasing murderous activities, it took the matter to an all-time high this Sunday with the bloodbath in Metele. The magnitude of the killing is too serious to be overlooked. Nigeria never had something as serious as that in its battle with terror. Not even the Jonathan era which detractors demonised to no end recorded any disaster close to what took place in Metele. Given the way Boko Haram attacked the Nigerian military battalion, killing the unit’s head and over 100 others, it has become evident that our flanks are open. Contrary to the claims of government, the fight against terror is far from being won. The claims of government are mere paper tigers. They do not actually exist. by its own conceit, the spokesman of the Nigeria Police, Jimoh Moshood, only two days ago, still called IPOB a terrorist organization. In this wise, we are waiting for the Jimoh Moshoods of this world to tell us the appropriate way to describe and package Boko Haram.